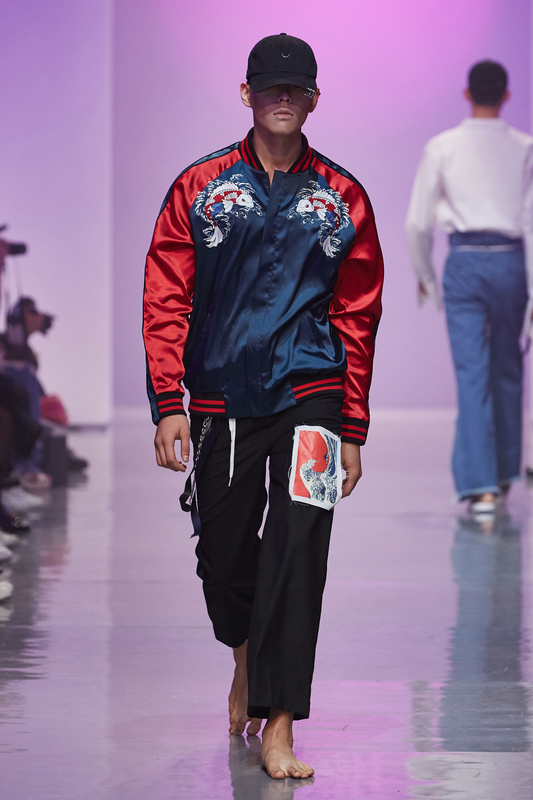 Contemporary label R.SHEMISTE showcases a collection that details inspiration from one of the most recognisable artworks of Japanese artist 'Katsushika Hokusai' called 'The Great Wave off Kanagawa'. What I particularly liked from this collection were the the strong colours expressed from the artwork. Designer behind the label, Won Ji Eun states, "R.SHEMISTE's 2016 S/S collection not only has Western silhouette, but also the oriental colour of the primary colours. Simultaneously, it expressed the harmony of the East and West with the artwork of 'Katsushika Hokusai' and R.SHEMISTE's modern sensibility." I also liked the embroidery of the koi fishes as well as the side piercing of the hats. It's a very nice illusion to make one think that their eyebrows are pierced. A very nice design on the caps. Not your average collection, this was a collaboration between a well known delivery service company in South Korea called Baedal Minjeok and designer Kye Han Hee. Yep, a delivery service company. Korea Times says this collaboration had only one purpose and that was to promote the Korean alphabet, also known as 'Hangeul'. 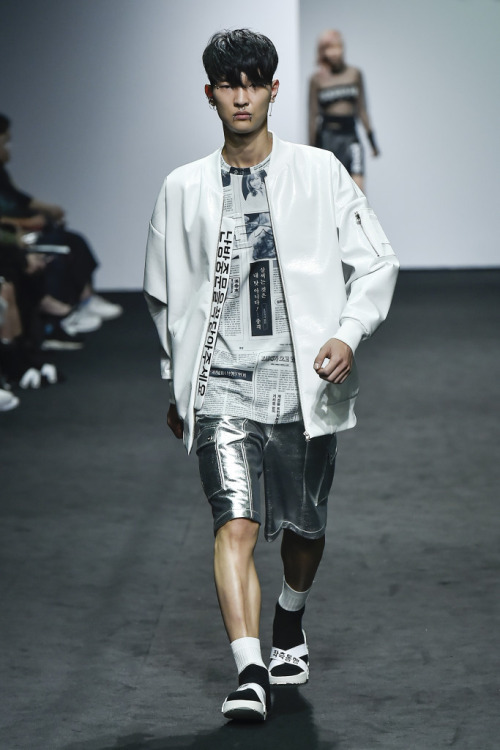 This was very evident as Korean words were imprinted onto the clothing which contributed to the 'street' vibe. 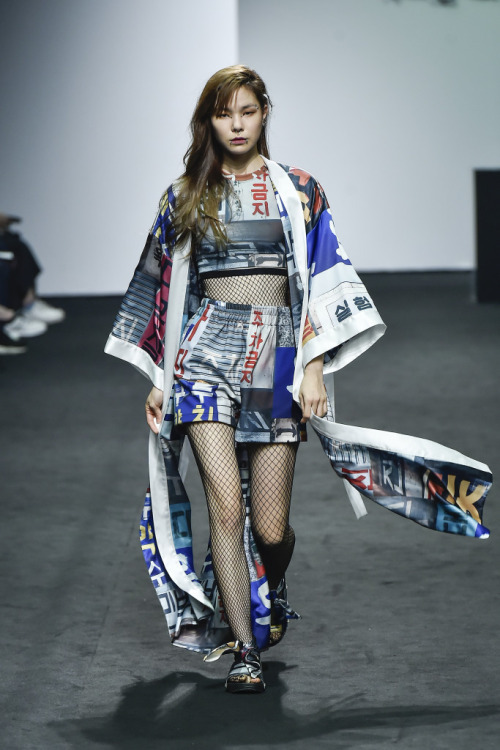 The Japanese alphabet has already cemented itself as part of fashion culture in most Asian street wear, so this direction of wanting to promote the Korean alphabet is really not surprising. Overall, I thought the collection was very unique. Not many images have been released from this collection but the video speaks for itself. Current creative director Jung Du Young unleashes the ombre of pastels with a sleek concept of classic contemporary. The show starts with rays of artistic elements that features the famous Michelangelo's 'The Creation of Adam' artwork, which then leads to a categorised colour show. I have limited knowledge in mens fashion but this was my favourite collection from the week! You can check out other collections from here.